By: Shen Guosun, trans. Roy Schmidt? Beauty and the Beast: Exquisite Play and Go Theory is a go book written by Shen Guosun, 7p. It was translated by Roy Schmidt? for Yutopian in 1996; and was originally published in Chinese as Weiqi Qili Yu Miaoshou. The overview of the book is the coverage of Chinese players' attempts to catch up with the Japanese in opening theory from the 1960s-80s. It does so through the exploration of the games, history & styles of notable, modern Chinese players, and by referencing several Chinese go classics, particularly the Qijing Shisanpian. The book argues that the traditional strength of Chinese go players was in their middle-game fighting, so that the direction of their modern opening research led them to openings (including joseki and fuseki) that would allow them to emphasise this strength. The book can be found here on Yutopian's website. Each chapter is broken into sub-sections (not listed here). 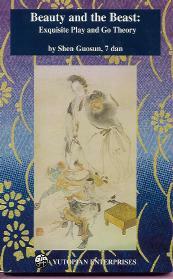 An early portion of the book has some discussion of the history of the Chinese fuseki and Magic Sword joseki. A partial collection of kifu referred to in the book.